An adult male Spanish sparrow, likely to be from either Spain, Turkey or North Africa, has moved into the gardens and hedgerows of a quiet coastal Hampshire village, Calshot. The Spanish sparrow, one of only eight birds ever recorded on British soil, has wasted no time in settling in to his new surroundings, as it's believed the lothario has already mated with native house sparrows producing hybrid species, according to the Hampshire Ornithological Society. The species are a common sight in countries such as (you guessed it) Spain, Turkey and North Africa but are extremely rare visitors to the British Isles. The most recent Spanish sparrow sighting in Britain was in 2000 in Cornwall, where the bird was only seen for one day. Previous to this, a Spanish sparrow was also spotted in Cornwall during 1996. This bird however, stayed around for two years. Calshot residents are welcoming birders from all over the UK as locals set up stalls selling tea and cakes in the village hall, with all profits going towards charities such as the RSPB. You can see more of this lovely bird and also the Dark-eyed Junco registered by birders on the same twitch, seen nearby at Hawkhill Inclosure, in the excellent video footage posted to YouTube below. Excitement is growing among UK birders as a fresh invasion of Two-barred Crossbill is widely expected. it's been a few years since the last, but Sweden has put UK birders on red alert as they report an increase of 177 per cent more sightings than normal, including flocks of 50, 60 and 130, all passing through southern Sweden in a roughly south-west direction. That's the good news, here's the bad news - it's being speculated that being a larch specialist, Two-barred Crossbill numbers are growing due to a failure in the larch cone crop, whereas Parrot Crossbill is either staying put in its core range or moving in a more easterly direction. 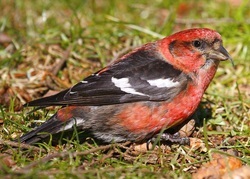 Parrot Crossbill, which actually breeds in Sweden on a regular basis, is down by 58 per cent. Birders who have a bit of spare time for a twitch have fingers and toes crossed at the moment as the route with which the birds are taking takes them almost directly to Spurn, Yorkshire in a straight line. The last Two-barred Crossbill invasion was captured forever in delightful photography during early August 2008, when there were 28 records involving 65 birds, mostly on the Northern Isles. In other news, sightings of the marvelous Northern Hawk Owl are up by 199 per cent in Sweden, indicating a very good breeding season for the species. A British visit by this legendary Arctic predator would cause much excitement among birders and is not beyond the realms of possibility. Our shores might also expect to see more Black-necked Grebes this autumn, as this species' sightings are up by an incredible 342 per cent. Three of the rare waders have been spotted at the Scottish Wildlife Trust's (SWT) Montrose Basin Reserve. There are only about 75 sightings a year of the bird in the UK - and the trust said they had never been spotted at the Montrose reserve before. 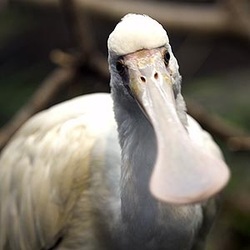 For those unaware of Spoonbills as a species, they have a long black flattened bill, which resembles a spoon at the tip and the species is a European conservation concern. A rare opportunity to tick one off the list. SWT Perthshire ranger Anna Cheshier commented it was a rare opportunity for bird-watchers to see an "unusual visitor" to the UK. "The spoonbill is unmistakable. It really stands out at Montrose Basin and we have been watching them carefully since the first sighting on the 28 June. I have never seen more than one spoonbill at Montrose Basin so it is great news to see a group." The group has been at the basin for over a week and Ms Cheshier said rangers hoped they would stay for a while.